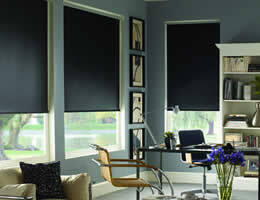 Our Classic Room Darkening Roller Shades offer the traditional look of a roller shade or pull down blinds. Each shade comes with a beaded cord loop for ease of use. Choose from the traditional roll or upgrade to a cassette headrail for a more elegant roller shade. Width or length over 66" will have to be railroaded which means there will be a seem in the fabric. Inside Mount fabric ordered width less 1.125"
Outside mount bracket to bracket plus 1.125"
Inside Mount Fabric ordered width less 1.5"
Outside mount bracket to bracket plus 1.5"
Inside Mount Fabric ordered width less 1.375" to 1.75"
Inside Mount Profile ordered width less .125"
Outside Mount Profile ordered width plus 1.625"
I ordered this as a backdrop for video work. I ordered this as a backdrop for video work. It is excellent, and I ordered two more after that. Very solid and perfect solution for my studio! The quality was great, and it was easy to install on the ceiling. I love my new blinds. They arrived quickly, fit perfectly and were easy to install. These roller shades work great, and they look simple and clean. These roller shades work great, and they look simple and clean. The reverse roll and inside mount give it a real modern look, which was exactly what I was looking for. I only wish I had understood the measuring better. If I had known/understood, I would have ordered the shade about a half-inch wider so the shade would actually cover the width at which I ordered. I did not understand the difference in measurement between the mount and the shade. I ordered 29" width -- but the shade actually only covers about 28". It's the mount that measures 29". Given the windows they are used in, I could have ordered 30" and had a better fit. The good news is, despite all of this, they still look great! Very pleased, indeed! We ordered the classic room darkening roller shades for the glassed in area of the foyer of our school gym. We ordered the classic room darkening roller shades for the glassed in area of the foyer of our school gym. We were able to measure the windows and discuss with the order desk while measuring, and the staff were superb in making appropriate size suggestions. The blinds arrived and were easy to install and operate flawlessly. Both Blinds Chalet personnel and products exceed our needs and offer more than we could have expected. Thank you! Love them! It took two of us about 40 minutes to install three blinds. The measurements were perfect and the instructions were simple. These look sleek and contemporary. Love them! !